As the year ends, we think reflect on all we are grateful for. Our relationship with all of you is one of the things we treasure. Thank you for the opportunity to help you create delicious barbecue, not only for yourself but also for your family and friends. We wish you a merry Christmas and much success in the new year. We will have altered operating hours for the next couple weeks during the holiday season. Christmas Hours: We will be open from 8am-Noon CST on Christmas Eve (Thursday, December 24) and will be closed until Monday, December 28. New Year Hours: We will have normal business hours Monday through Wednesday (December 28-30) and will close at noon on New Year’s Eve (Thursday, December 31). 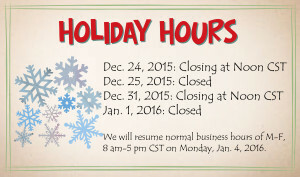 We will re-open on Monday, January 4, 2016 with our standard business hours of 8am-5pm CST, Monday through Friday. If you have any questions on cooking, give us a call before we close for the long weekends or you can ask questions on our Uncensored Forum, check out our cooking videos for Turkey and Ham or see our recipes on the website. Happy holidays from everyone at Cookshack. We hope your holiday season is filled with memories, friends, family and delicious barbecue!